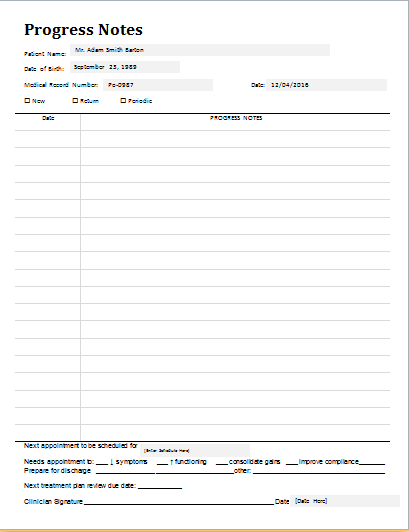 Medical progress notes are reports written by professional health care providers to record the progress a patient makes while he/she is hospitalized. Many a time it includes how the patient responds to the prescribed treatment and medication. In other words, it is a detailed description of a patient’s clinical tenure spent by stating the patient’s progress and achievements whether regressive or progressive. The medical note begins with the patient’s name, age, gender, contact information, medical record number and medical insurance[if any]. It further goes on to give a detailed record of why the patient came for the check up whether he/she was referred and if so then by whom. The tests were done on him/her while he or she was hospitalized, which doctors have consulted and who were the nursing staff attending to the patient. It also records what treatments were applied to the patient, what medications were given and how the patient has responded to them. These notes can be taken by the attending nursing staff, social worker, therapist or a doctor whoever is interacting with the patient during treatment. For proper record keeping date and time is noted duly while writing each entry. The record is not important just for the hospital or the patient but also can be used as a case study by training doctors as well, not to mention its importance if the patient is to be referred to another doctor or is to have retreated after some time.